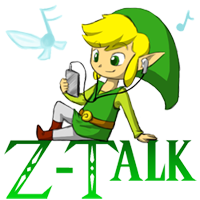 Din, Rish, and the Zelda Dungeon crew are back again with another podcast for you! We have a diverse cast lined up this time with some new voices, which we appreciate very much. Remember, if you would like to take us on the go with you, download this cast using the link below or download all the podcasts on our iTunes page. What is your opinion of the topics brought up today? What do you think of the mysterious Kaepora Gaebora? Do you think remakes are a good idea? Should remakes be only for certain games? How do your talks with non-Zelda players pan out? Could you answer the Keaton Quiz questions before the contestants? Join the conversation! There are a lot of ways that you can get involved with Z-Talk if you would like to take part. First and foremost, you can submit your own submission to Z-Talk. Is there something about Zelda you want to talk about on the podcast? You should check out the invitation found on our forums and get in touch with Rish and I by email, on the ZD forums, or by Skype (contact: din_akera). You can also record your voice and send in a question to Din and Rish’s mailbag, or if you would prefer to have us read your question for you, send it in text also to the email above. But, if you would rather have us ask you the questions, you can sign up to be a contestant on the Keaton Quiz! Or you have a question you want to be asked to a guest on the Keaton Quiz you can email the question and answer and listen for your question on upcoming Keaton Quizzes!